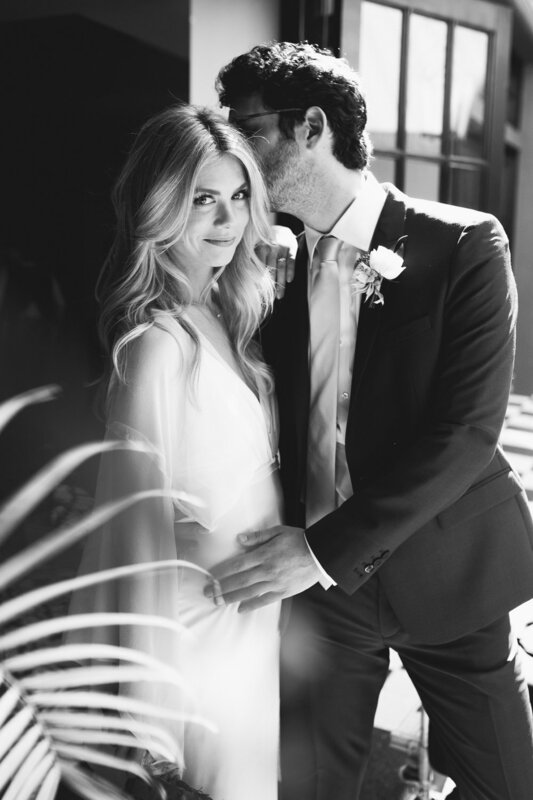 Kristina and Max’s wedding day was filled with countless sweet and sentimental moments! Starting with their venue the Palihouse, West Hollywood, which was the location of their first kiss! Kristina and Max did an incredible job of making their wedding uniquely theirs. 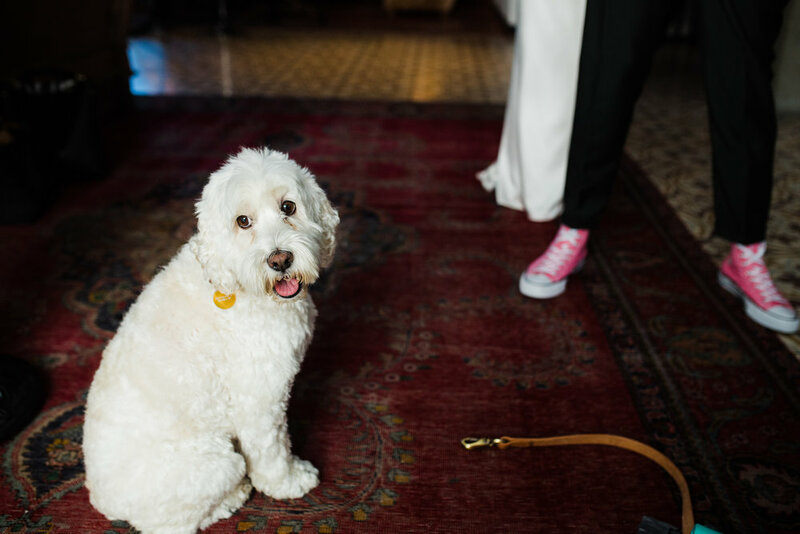 They incorporate both Jewish and Buddhist traditions into their ceremony, included their sweet pup Pancakes and instead of a wedding party had an Honor Party that incorporated all of their friends! They also showed of their individual styles, Kristina by wearing a custom dress from Shareen Bridal and Max by wearing a green luster suit with pink converse! As only children friendships have taken on extra special meanings in Kristina and Max’s lives. Their friends are family. Their group of friends from across the country brought such a special feeling of community and love to the day. 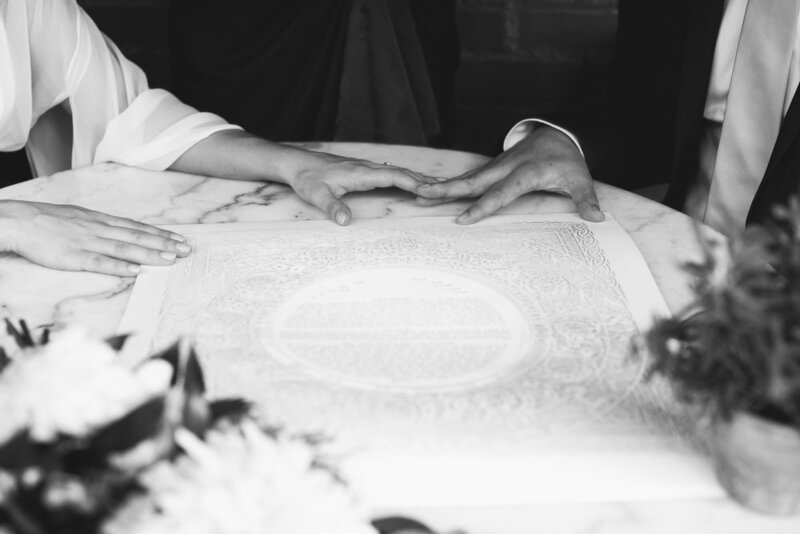 They contributed both of themselves and their skills to honor the couple by officiating, performing a sake ceremony, giving speeches, sing the first dancing song, performing magic tricks and more! It was such a joy to be a part of a day that was so deeply rooted in the value of friendship and love in all forms! 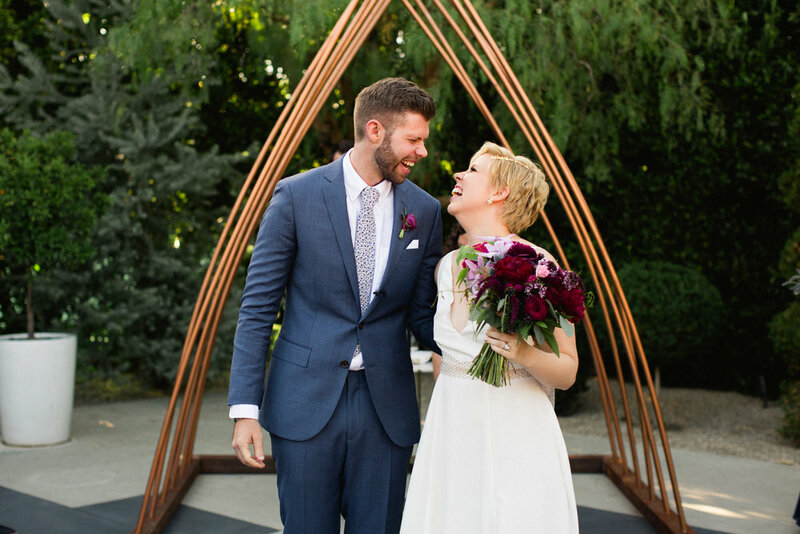 Erin and Jake win the award for “Smiliest Wedding.” They have two of the best grins we’ve ever seen and their joy to be marrying one another was apparent the entire day. Not only were they joyful and smiley, their guests were too. Throughout the day Ivan and I kept turning to one another in disbelief at how many cute candids we were getting. Everywhere we turned were sweet, smiley interactions! As I began working on their images I found myself beaming at my computer screen. 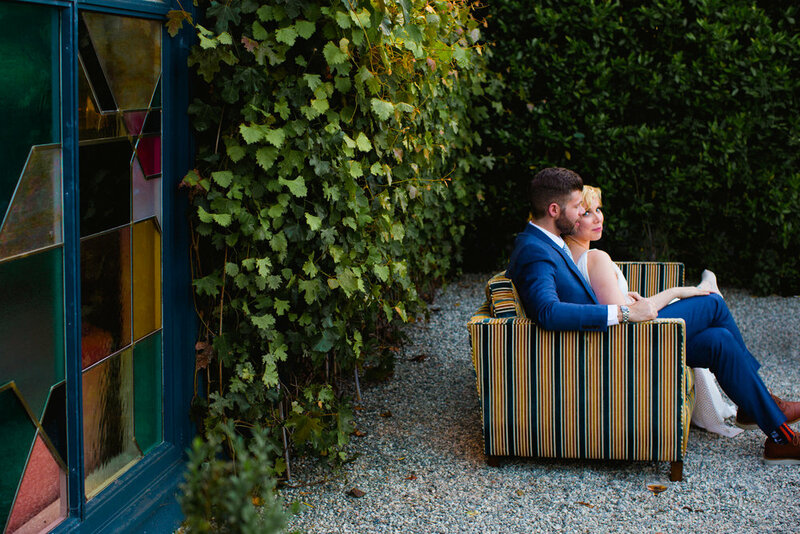 The Fig House in Highland Park was the perfect venue to compliment their bright, energetic personalities. The entire space is splashed with color, every inch beautifully decorated with thoughtful and vibrant details. I think it just may be my Spirit Venue! Not only are Erin and Jake fellow color lovers, they are first and foremost dancers! 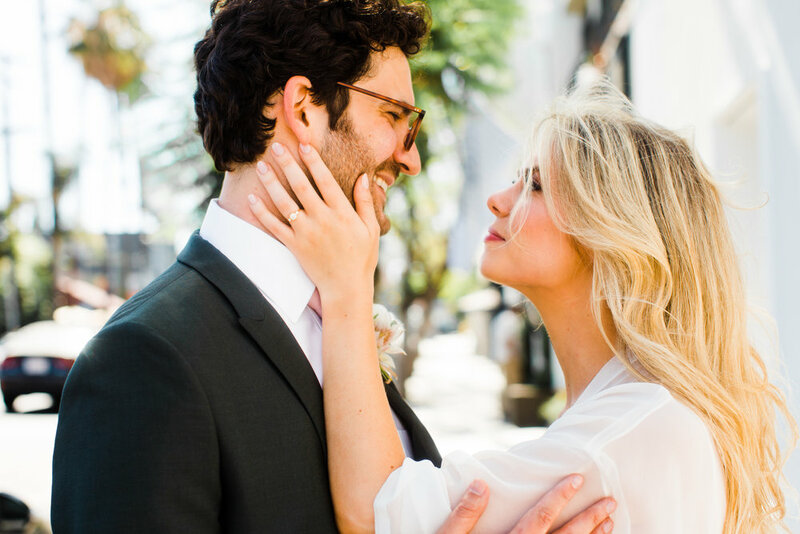 Erin grew up dancing, they met while dancing, and in their vows they committed to be one another’s dance partner for life! With such a deep love of dance we knew we were in for a treat with their first dance. We were blown away when they brought down the house with their dance to ‘Golden Years’ by David Bowie. Their chemistry on the dance floor was such a joy to capture and the energy they brought was shared with their guests. When a bride and groom love dancing as much as these two, people come ready to cut a rug! Everyone was dancing from Grandma to the flower girl! We loved being in the sea of guests, surrounded by music, joyful interactions and amazing dance moves. 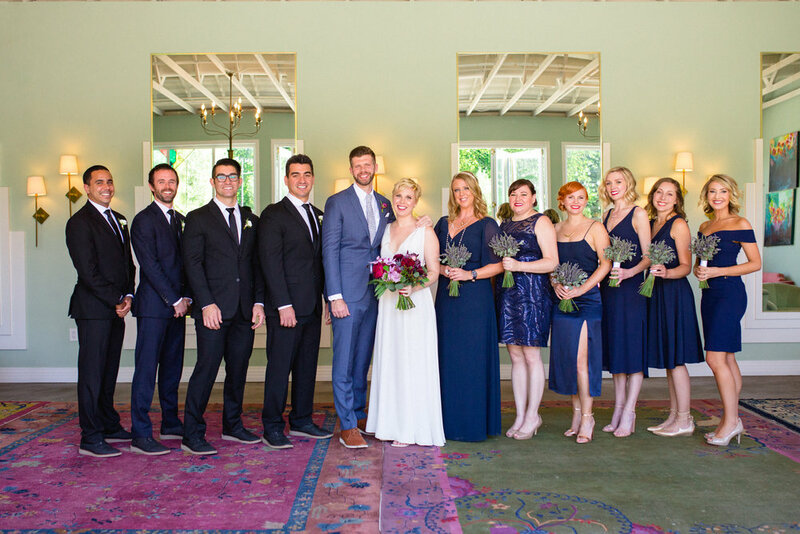 Erin and Jake’s day contained so many of our favorite things—color, wild dancing and intentional details—but most of all their day was focused on community. 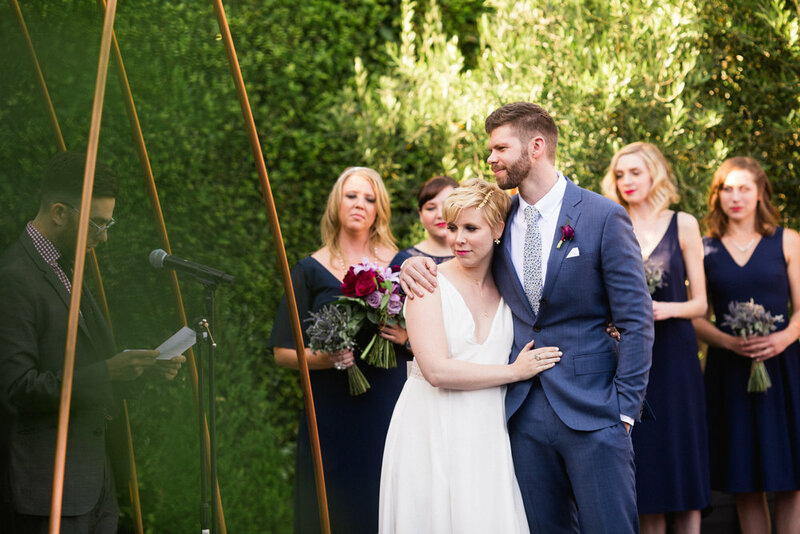 From Jake’s 4 families, their 2 friend officiants, the countless hugs, sweet excited squeals and heartfelt speeches, it was clear how much Erin and Jake love and value their people and how much those people love and cherish them. Seeing these connections is always a deeply profound honor. 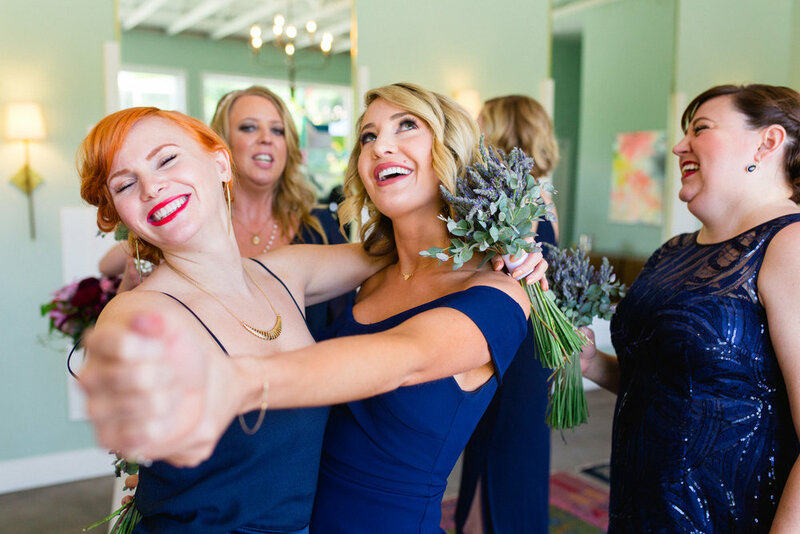 We feel so lucky to experience and capture all the love, from the little moments like a heartfelt greeting, to the big moments like a mother-daughter dance. 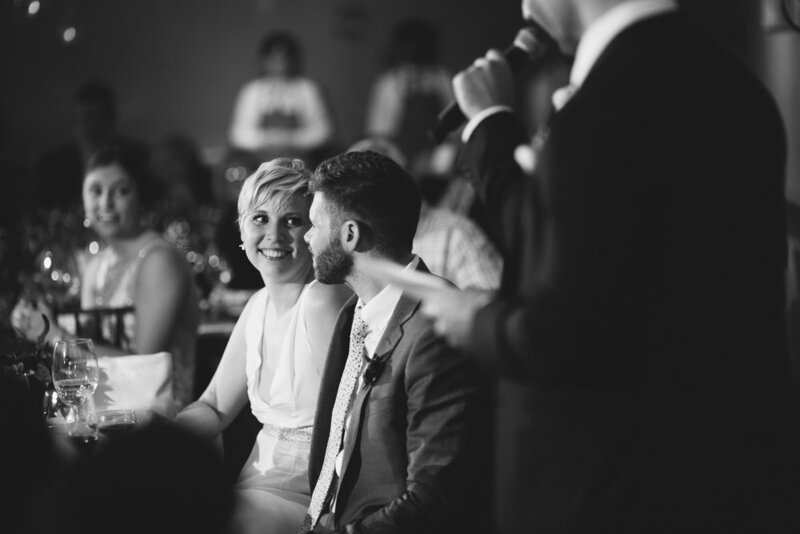 Wedding days never cease to bring me back to what it’s all about: the relationships we build and the love we share. Erin and Jake, thank you for including us in your wedding. For welcoming us in to witness the relationships you’ve built and the love that you share. We are so honored to have been a part of it all. Here are some of the memories of that day. We can’t wait to share more! April 7th was special. It was Devika and Rilwan's elopement but that wasn't the only monumental part of the day. April 7th was the day their families were meeting for the first time. As we stood on the steps of the Beverly Hills Courthouse I got to witness their moms welcome one another into their lives, arms out stretched, tears in their eyes. I got to see Devkia's sister, snuggle and play with Rilwan's niece. I was able to see the heartfelt connection their fathers made via facetime. I often get to witness two families coming together at a wedding but this was different. This was bigger. There was so much wrapped up into one moment, it was the greeting, the getting to know and the embracing of two families and cultures all at once. Their Beverly Hills Courthouse ceremony, conducted by a passionate and kind Justice of the Peace, was heartfelt and genuine. She shared beautiful and honest words of wisdom, that have stuck with me. She shared that for a successful marriage the couple must grow together but more importantly they must grow as individuals. She encouraged them to explore their separate interests and to strive to grow personally in order to strengthen their marriage. Such a strong and useful message in a marriage ceremony! After Rilwan and Devika said "I Do" we got to stop at the iconic, pink, Paul Smith wall for a few fun portraits and then made our way to Gracias Madre for some snacks and delicious cocktails. It was such a treat to be able sit and enjoy 45 minutes with Rilwan and Devika. Typical wedding days are go, go, go. I loved getting to capture a bride and groom relaxing and enjoying one another's company. The staff was so excited to have a newly married couple that they sent drinks to the table and offered Mexican Wedding cookies! Rilwan and Devika's wedding was a true lesson in rolling with the punches, looking at the positive, and being present in the moment. Due to flight cancellations as a result of an airport bomb threat Devika's father and sister were unable to make it to the wedding, a heart breaking reality of the day. Despite this set their presence was very much felt throughout the day! Thank goodness for technology! Facetime allowed them to see the ceremony, enabled Devika's father to give his speech at their reception dinner and made it possible for them to meet all of Rilwan's family. It was especially sweet to see both fathers meeting. Rilwan's father's hand on his heart as the both talked about the pride and love the felt. Another set back of the day was when all 14 guest accidentally went to the wrong restaurant. Instead of being upset or stressed, Rilwan and Devika spent the time snuggled up, chatting and laughing in the outdoor lounge at Craft Los Angeles. The stayed in the moment and were focused on one another. When everyone eventually made it they excitedly welcomed them, no stress or frustration. Wedding days are unpredictable, things will go wrong, but those hiccups don't have to ruin the day or even cause stress. The day is going to unfold just as it is meant to. As long as your focus is on what matters most and you remember to breath and laugh your day will be wonderful. Rilwan and Devika did just that! The entire day they were laughing, snuggling and just so happy! It was such a joy to witness their marriage. The union of their families and their love for one another. Mid-February, we stepped off the plane in Colombia and were immediately swept up by Cartagena. Within minutes of leaving the airport all of my senses were invigorated: the smell of the sea, the cozy feel of humidity, the colors of the buildings, the sounds of the streets and the sweet taste of mango. The energy within the city walls was electric. It made me feel more alive, more present. Our time spent there brought me back to myself. It encouraged me to refocus on what is most important: family, friends, meaningful connections and purpose. On our first morning we wandered the colorful streets as we made our way to Casa Pestagua, where we found Alexis and Edwin. It was at this point that the reality of the weekend sank in. Not only were we here in Cartagena to celebrate Alexis and Edwin, but we were here to celebrate along with some of our nearest and dearest friends. If I had to imagine heaven, it'd be a lot like our time in Cartagena—days spent in a beautiful setting, surrounded by your favorite people with the shared intention of celebration, all the while getting to do a job that you love with the person you love most. Oh, I could go on and on about this wedding weekend, about how humbling it was to have witnessed Alexis' and Edwin's families share their cultures, American and Colombian, with one another; about riding a chiva (party) bus through Cartagena next to the mother of the bride as we laughed hysterically and danced on cue; about how moving, heartfelt and real the vows Alexis and Edwin shared were; about how special it was to reconnect with some of my oldest friends; about how ridiculously fun the reception was, or how grateful I am for the sweet friendship that has grown between Alexis and myself. I have so much to say but what it would all be explaining is that this experience healed parts of my heart that had been aching for a long time. This wedding, the place, the people, Alexis and Edwin reminded me of what is most important at a moment when I truly needed it. This is the story of that day in the best way I know how to tell it. 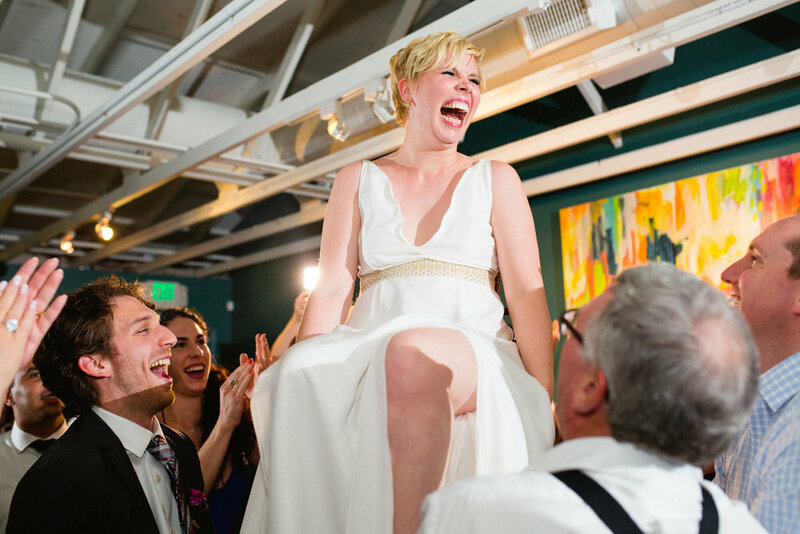 Christine and Jenny knew they wanted a pop-up wedding in Washington, DC. They also knew they wanted their wedding to reflect their first date since it would be on the 4th anniversary of their meeting. Jenny and Christine's elopement was one of the most unique and fun weddings I have ever had the honor of documenting, every aspect of the day was thought filled and reflected who they are! Their ceremony took place in front of The Blind Whino, a one of a kind muraled church that is just 2 blocks from Jenny and Christine's home. With just their family present at the ceremony and Congresswoman Karen Bass officiating the wedding was intimate and heartfelt. From The Blind Whino we took pedicabs through the city. This was an homage to the bike tour Christine and Jenny took on their first date! We ended our ride at the Taste of DC a food festival on Constitution Avenue. 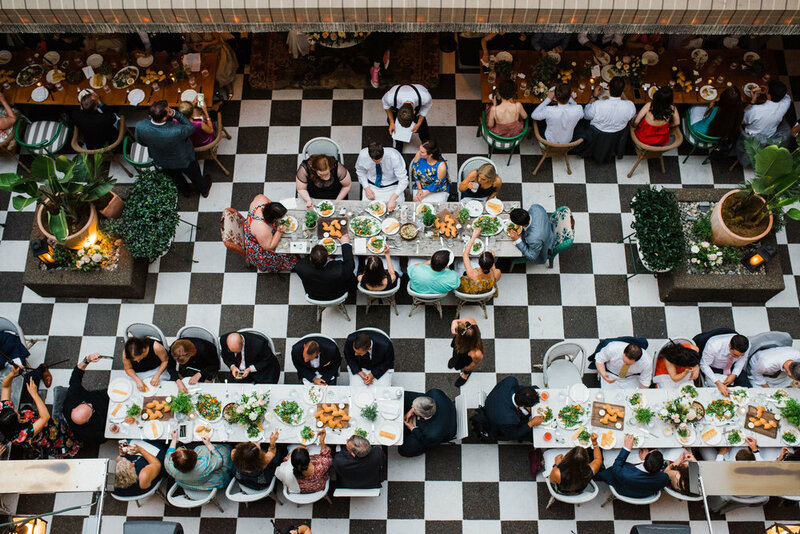 The Taste of DC was the final part of Christine and Jenny's first date and the reception site for their wedding. When we arrived we were greeted like celebrities with cheers and ushered through the VIP gate to a private tent complete with a Just Married sign. Throughout the day strangers called out well wishes to Jenny and Christine or stopped them to give hugs and share in their excitement! Often people call out to couples "Congrats" or snap a photo on their phone but this was different. People stopped and chatted with them for several minutes, asked for photos with Jenny and Christine and even gave them free gifts! The well wishers were all types of people, from all different backgrounds - from a security guard at the Renwick Gallery, to the Taste of DC Organizers, to journalists, to a retired Marine. The joy that people were sharing for a couple they didn't even know was remarkable! We finished the day riding five stories into the air on a crane lift. As we rose above the crowds lining Constitution Ave., and looked out at the Capitol Building I felt a swell of pride to be in an American. I felt hopeful, that we as a nation we were headed in the right direction. In the days since the election my pride and hope have been tested. I have felt confused and saddened, as many of us have. 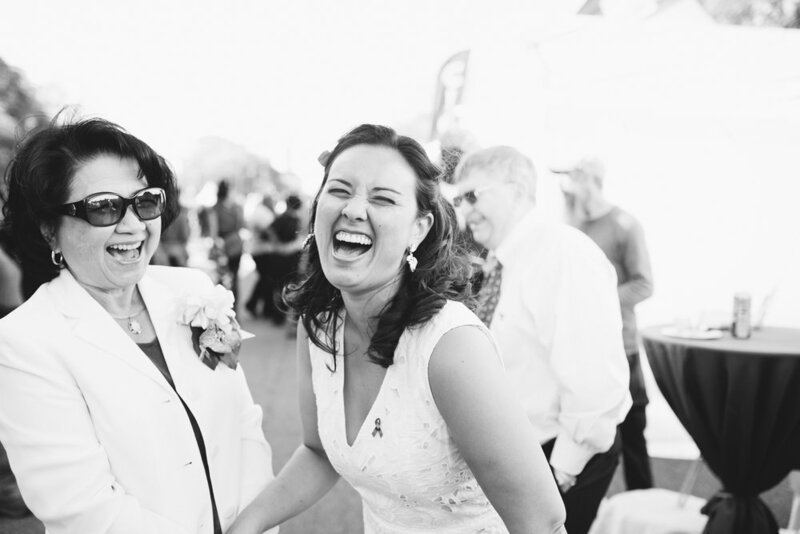 But the images from Christine and Jenny's wedding have reminded me how hopeful I felt. As I look over these images I am reminded of the community of strangers that came together to celebrate their union. I am reminded of the celebration of diversity and the shared joy of their day. In the days since the election Jenny and Christine's wedding has given me hope and perhaps, if only for a minute, it will for you as well. A Renwick Gallery security guard stopped Jenny and Christine to congratulate them with hugs and well wishes! Jenny and Christine's first dance was held on the main festival dance floor, surrounded my hundreds of strangers watched on as the danced and then after joined in. It was beautiful to feel the support and excitement of all the strangers around us.